Until Greek yogurt become more widely available in the United States in recent years, as a native German I felt extremely Quark-deprived. Creamy Quark, which is often referred to as cottage cheese without curds but is actually nothing like it, is my favorite dairy product. It can be made at home (the recipe is in my cookbook Spoonfuls of Germany), however, the process is lengthy and quite involved, and getting the right consistency is a hit and miss. Greek yogurt is an acceptable substitute for desserts calling for quark, and other non-baking recipes. For cakes and pies, however, I find it rather flat. But don’t get me wrong, I am already quite happy to be able to make desserts that taste almost like Quark. 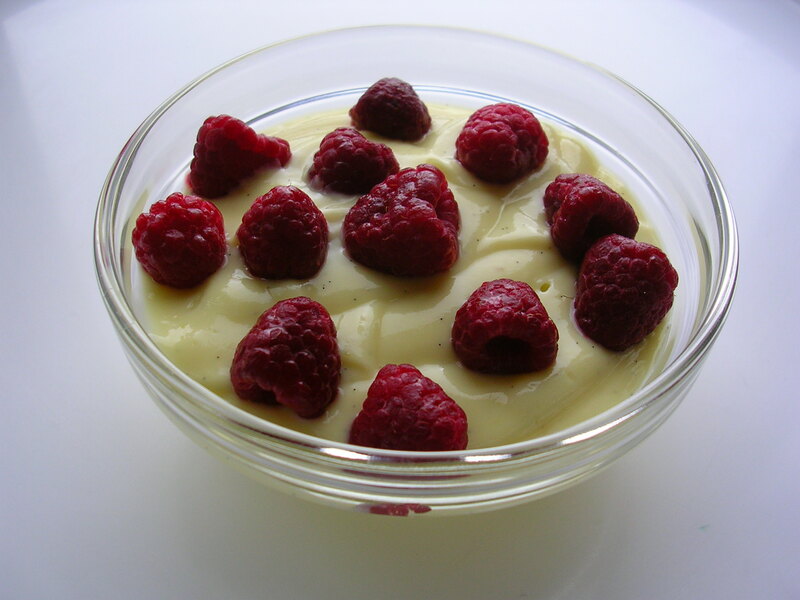 When I was a kid my mother used to make this vanilla custard with Quark, which I could eat by the tubful. She used instant custard powder while I make the custard from scratch. I topped it with our last own frozen raspberries but there is room for experimentation here. 1. Put the milk in a small pot. Split the vanilla bean lengthwise and scrape the seeds thoroughly into the milk. Add the vanilla bean to the milk and slowly bring to a boil. 2. 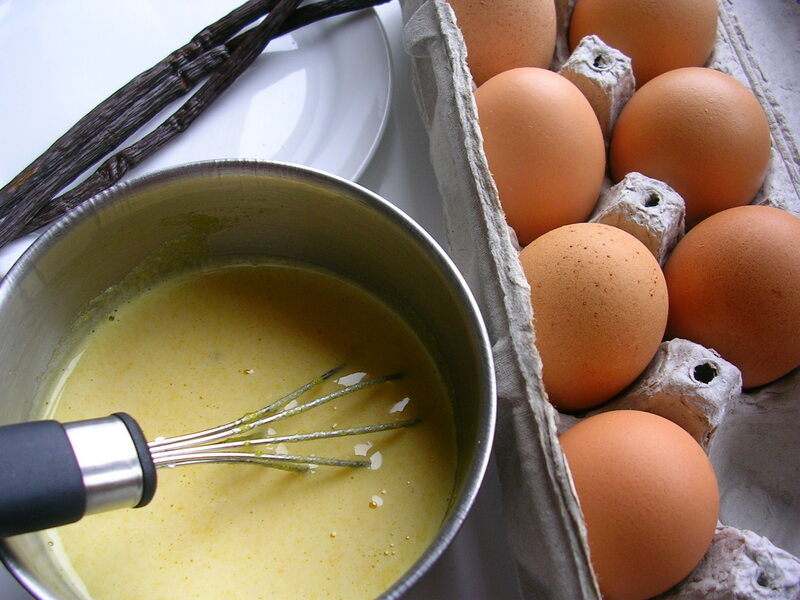 In the meantime, whisk the egg yolks with the cornstarch and the sugar until both are dissolved. There should not be any lumps. 3. Strain the milk and pour it back into the pot. Put it back on the stove and whisk in the egg mixture. 4. Bring to a gentle boil until the custard thickens, whisking constantly. Make sure to also scrape with the whisk over the bottom to prevent the custard from sticking and burning. 5. When the custard is nice and thick, remove from the heat immediately. Let cool completely, stirring every now and then. 6. Add the Greek yogurt and whisk until creamy. Refrigerate. Top with berries or other fruit to taste. So what’s a decent substitute in baking? I’m trying to make a quark teig plum cake….